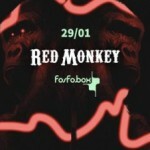 Friday’s Rio Nightlife Pick – It’s time once again for the best of global bass, trap, and future beats as the Red Monkey party returns to Fosfobox in Copacabana tonight. DJs Ferretti, André Menezes, Wladimir Gasper, and Mr. Red Monkey will spin in the subsolo (basement) during the night and Street Crew and DuWolf will spin above at the Fosfobar during the party. Additionally during the night, graffiti artist Pedro Henrique R. Fernandes will paint live and Street burguerZ will be selling food during the party. Brazilian percussionist Sérgio Krakowski will perform live with Paulo Dantas tonight at Oi Futuro Ipanema as part of the ongoing Rc4 Festival. Karakowski is internationally known for his innovative uses of the pandeiro (Brazilian tambourine) and for combining his performances with electronics for immersive experiences. His has presented workshops in New York, Paris, London and Berlin and has performed in the Guggenheim de Bilbao in Spain and Galerie 59 in Paris. Tonight Circo Voador will host Jardim Elétrico with Boogarins, O Terno, Figueroas and Bike. Popular bloco Monobloco will hold another Carnival pratice live at Fundição Progresso tonight as part of the venue’s Sextas de Verão events. Tonight will mark the second of three practices before the bloco’s Carnival parade this year. Samba Sofia will perform to open the night. Fundição Progresso – House will open at 10PM. Brazilian band Roupa Nova will perform live at Metropolitan/Citibank Hall in Barra da Tijuca tonight and tomorrow night. Singer-songwriter Aleh Ferreira will perform live tonight at Audio Rebel in Botafogo. 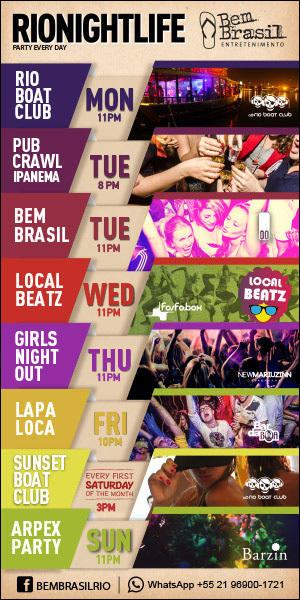 Tonight it’s time again for the Pub Crawl Lapa Loca. The meeting point to begin the crawl is at Rua Mem de Sá, 55 from 10:30 PM to 11PM. There will then be an open bar from 11:10 PM to 12:10 AM at Bar da Cachaça. Then from 12:20 AM to 1AM there will be free entry at the next location and one free shot of tequila or a caipirinha. The crawl will then arrive at 1:20 AM at its final stop at Bar da Boa for the Lapa Loca party. Entry to that party will be free and pub crawlers will receive one free caipirinha. The CAVE club in Arpoador will host the Opa! party tonight with DJs Olliver Mach, Maz, Paula Carvalho, and Igor Kelner spinning the best of house, techno, deep house, tech house, hip hop, twerk, and trap. The Red Monkey party returns to Fosfobox tonight with DJs spinning the best of global bass, trap, and future beats on two stages throughout the night. The Rock on the Roof party returns to Centro Cultural João Nogueira in Méier tonight. A Spotify party celebrating one album by one artist or band during each edition, tonight Daniel Pandeló will present the Arctic Monkey’s 2013 album, AM. Entrance to the party is free. Tonight Casa da Matriz will celebrate the 14th anniversary of the Paranoid Android party. DJs Bgolls Incrível, Igor Boechat, Fab!tch, and Dí Andrade will spin the best of indie rock and indie pop on the first floor and pop hits on the second floor during the night. Additionally there will be alcoholic popsicles and two-for-one specials at the bar. Teatro Odisséia will host the Unicorn! party tonight. DJs Bruno Ambrozi, Dave Avigdor, and Nathalia Hinz will spin the best of pop and funk and there will be karaoke on the second floor during the night. Tonight Cabaret Lounge will host Cabaret em Festa: “A História do Rock.” The band Grecco will perform live and DJ Luizinho will spin during the night. La Paz in Centro will host Baile do Pig Jack. DJs Thiago Cortez, Nicolle Neumann, and others will spin the best of rap, hip hop, funk, trap, and pop on the Pig stage and the best of charme, soul, and jazz on the Jack stage during the night. Raízes da Lapa will host the B.L.E.S.S. and Trap IN parties tonight with DJs spinning the best of reggae, trap, hip hop, and funk throughout the night. DJs will spin the best of cumbia, funk, reggaeton, trap, MPB, and rap as the La Cumbia party takes over Arco do Teles. It’s time for the best of Jamican music as Porto Pirata hosts the Reggae Fever party tonight. Singer-songwriter Roberta Espinosa will start the night tonight at Rio Scenarium at 8PM with a a lively mixture of jazz, funk, ijexá, and samba. Aninha Portal will follow at 11PM with the best of contemporary and traditional samba and then at 2:30 AM Trio Rapacuia will begin performing the best of forró. It will be a performance that lasts until sunrise on Saturday morning. Vocalist and instrumentalist JP Silva will start the night at Carioca da Gema tonight and Julio Estrela and Marina Iris will follow with the best of samba. It’s time again for Lapafest at Leviano bar tonight. Singer Lucas de Moraes will start off the night by performing his reinterpretations of works by Zeca Pagodinho, Jorge Aragão, and Clara Nunes, among others. The bloco Picada de Primeira will then perform the best of samba, MPB, soul, and samba reggae. On the second floor during the night, the power trio Johnny’s will perform the best of international pop rock. Additionally during the night, DJs Chicote and Ailton Areas will spin the best of samba, sambalançco, funk, hip hop and electronic during show intervals. It’s time for the best of traditional Irish Music as Navar and Friends return to perform live at Lapa Irish Pub tonight. If you’re looking for quality imported beers and a welcoming environment to drink them in, this is the place to go. Tonight Saloon 79 in Botafogo will host the first edition of the Teto Preto (Rock e suas Vertentes) party. DJ Priscila Dau will welcome DJs Alexandre Brandáo and Julio Bessa to spin the best of rock, metal, punk, and industrial during the party. Saloon 79 – House will open at 11PM. Tonight to pay tribute to David Bowie, Bar do B in Laranjeiras will host Um Brinde Ao Bowie! (A Toast to Bowie). DJs Andre Nalheiro, Davi Lisbowie, Fabio Monstro, Ramir Lavor, Rataus, Thiago Halleck, and Renato JKBX will spin during the night. Entrance will be R$10 with names on the list until 1AM. Anyone with a Bowie shirt or Bowie makeup gets in for R$10 all night. Promotions will include Cuba Libre, Hi-Fi, Caipirinha and Caipivodka for R$10 each. 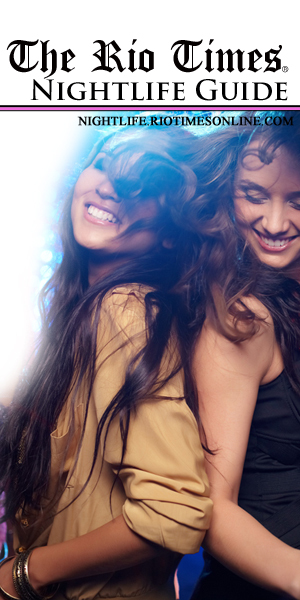 Entrance: R$10 with name on the list until 1AM, R$20 – R$25 without name on the list and after 1AM. Anyone with a Bowie shirt or Bowie makeup gets in for R$10 all night. It’s Ladies Night at the Lord Jim Pub tonight. A DJ will spin the best of the Eighties and promotions will include two-for-one specials on sparkling wine for women and tequila and Jagermeister for everyone. In addition to great drinks and authentic Mexican food, the Blue Agave bar and restaurant in Copacabana is one of the best places to watch live sports. Also, be sure to check out the Blue Agave in Ipanema. Since its opening, the OMG Lounge has been attracting both locals and tourists alike with its intimate atmosphere and new varieties of food and drinks. Know for its cold beer, specialty beers, and great atmosphere, The Lucky Screw American Irish Pub also hosts live music every night of the week except for Wednesdays. Additionally, this is a great place to watch live sports. Mud Bug in Copacabana provides a great selection of food and drinks, including more than thirty types of international and national beers. With classic pub games like darts and pool, Ipanema’s Shenanigan’s is always a great spot to visit. This is a great place to watch live streamed sports, both international and national.